Below Deck - Cabins where the hull slopes inward towards the keel with minimal port holes and hatches. Mid Deck - Areas on main deck with small or shaded windows. Above Deck - Areas with large glass surfaces and direct sunlight. Multiply the length and width of each cabin to be treated to determine the area in square feet or metres. It is assumed the boat has an average headroom of about 6.5ft (2 mtrs)with an average amount of furniture. If one end of the cabin is narrower than the other take your measurement in the middle. Temperate: 95°F (35°C) air, 85°F (35°C) water, moderate humidity. Tropical: 105°F (41°C) air, 95°F (35°C) water, high humidity. Taking into account the boat’s size and layout, determine the number of self-contained systems or air handlers needed. 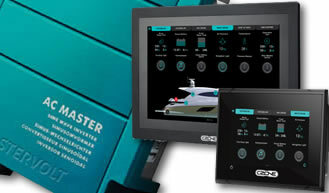 Taking into account the boat’s size and layout, determine the location of each self-contained system or air handler. 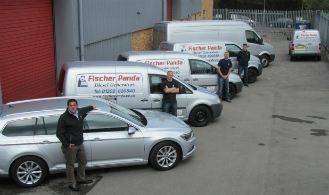 In addition to leaving enough room for plumbing and ducting, there must also be sufficient space in each installation location for servicing and/or removal of the unit. Use one pump of adequate capacity for all air conditioning systems on board. The basic rule is 180 gallons (681.4 liters) per hour (3 GPM/11.4 LPM) of water per ton of air conditioning (one ton = 12,000 BTU/hr). If more than one system shares a common pump, you will also need a pump relay and manifold. The BTU/hr capacity in the table below shows recommended seawater flow rates and minimum inlet (through-hull) sizes. Determine the proper duct diameter (Ø) and grille sizes for your air conditioning system. Use the table below to find the correct sizes, which are based on the system’s BTU/hr capacity. Controls: There are two types of controls, digital and electromechanical switch. Digital: These keypad/displays are part of a microprocessor system with many advanced functions, including automatic fan-speed control, fault display, and a dehumidification program. Decorative bezels can be added to complement the vessel's interior decor. Mechanical: These manual switches with two or three rotary knobs control the mode of operation, thermostat, and variable fan speed. Reverse-cycle models have automatic changeover between heating and cooling. 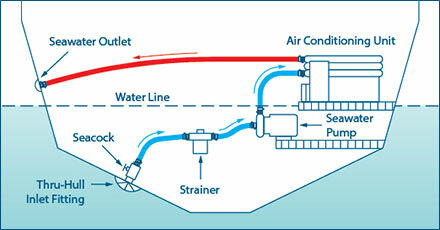 The seawater cooling system (shown in the illustration below) brings seawater into and through the system then discharges it overboard. It consists of an inlet through-hull fitting, seacock (water valve), strainer, pump, and overboard discharge fitting, all connected by hose or piping. In cooling mode, warm cabin air is drawn into the self-contained unit or air handler through a return-air grille. It is then cooled and blown through flexible insulated duct and back into the cabin through a supply-air grille installed high in the cabin. 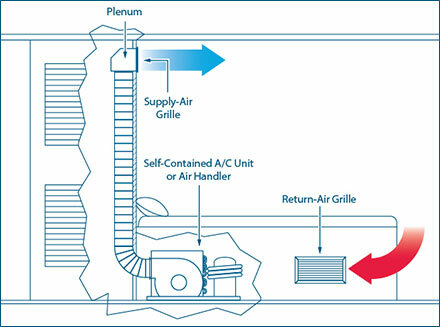 The supply-air grille should be installed away from the return-air grille to ensure good circulation (see the illustration below).